Black and white color always considered as neutral color that can be used for anything, but can you combine only those two colors as black and white home décor? Actually black and white color has always been a classic color combination that can be used for any room in your house. Because of the two neutral colors, the room will appear elegant and sophisticated. Since those colors are timeless you can get room which always appears trendy and chic forever. It is also suitable for any kinds of theme from modern, to classic and even Asian theme. Let us learn more about ideas that you can do with black and white color combination. White kitchen appliance is very beautiful, however sometimes it is quite difficult to use since you do not know how to decorate it. This is where black and white home décor ideas come out since you can use black kitchen cabinet for the background of your white kitchen appliance. That way you can create the best color combination in your kitchen. Of course you can also do it the other way around and use white kitchen cabinet with black kitchen appliance instead. The good thing about black and white color is you can reverse the role anyway you want. A lot of people love animal print even though it is fake and not the real one. However it is quite difficult to use animal print without making them feel too much. Actually you can use black and white color in the room which very suitable with black and white animal print. There are a lot of black and white home décor animal print that comes naturally with this color combination such as zebra print, white tiger print, white cheetah print, cow print and many others. You already know the beauty of graphic pattern, but the problem it is actually quite difficult to use the pattern since it is made with quite dramatic design. But using white and black color cam make your black and white home décor graphic pattern fits well inside the room. Then you can use the pattern as the focal point of the design to increase the value of your room theme. You can even use it on the hallway to make them more dramatic. If you want to have a formal dining party in your house but you do not want to use difficult theme, then you can just use black and white home décor monochrome theme for the dining table setting. The color will suit any occasion you had for the dinner party so you can just use this set whenever you want. Do not forget to stock your kitchen with monochrome homewares with black and white color and pattern. That way you can mix and match the item used for the dining table setting anytime it is needed. Do not forget the ultimate black and white home décor design which is the chessboard flooring. This design is the classic black and white color combination which can be used in any room that you want. The pattern also timeless and you can even use it with any theme you have in your house since it suits most theme. Use your flooring as the focal point of your room and add more interesting accessory to match with the pattern. Since black and white is considered as neutral color, you can actually use this color with any pattern that you want. The color would be able to neutralize the heavy feeling that the pattern has so you would not feel that the pattern overpower everything else in the room. You can even combine several patterns together as long as they have black and white color combination to link them all together. But remember that you should still do it in moderate and not put all pattern together since it will make it too much. The key is to balance the pattern together, which is why you also need to use solid color in between the pattern to neutralize it. 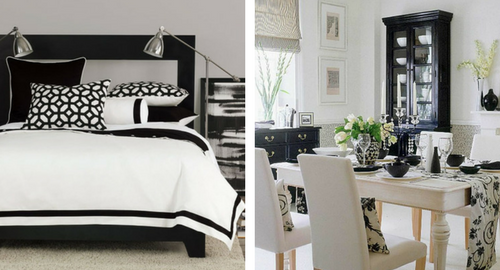 Even though you do not want to use any pattern in your room, but black and white home décor is already beautiful on its own. That is why you can just design the room with all solid colors. Both black and white are suitable as background colors; this is why you can just alter the background paint in each room to add difference for each room. You will see that by changing the background color will give dramatic change in the room, thus make the atmosphere different according to how you style it.